Chicory coffee, a coffee substitute cultivated from the Cichorium intybus plant, has historically been used as a medicine for wounds and several health conditions, including diabetes. While not all of its purported benefits are substantiated with scientific evidence, chicory coffee does offer many short-term and long-term potential health benefits. It may protect the body from damage and lower the risk of certain chronic diseases. Sufficient intake of soluble dietary fiber, an essential nutrient, is associated with reduction of cholesterol and blood pressure, the improvement of healthy gastrointestinal function, and several other digestive and health benefits. According to a February 2010 review by "Comprehensive Reviews in Food Science and Food Safety," chicory root contains a soluble fiber known as inulin. This fiber protects against the accumulation of free cholesterol and provides other metabolic benefits, such as the promotion of iron absorption. In addition to its use in coffee substitutes, inulin is extracted from chicory for use as a sugar substitute because of its low caloric value. According to a 2013 review by "Evidence-Based Complementary and Alternative Medicine," the chicoric acid found in chicory coffee protects the body against bacteria found around the teeth, indicating antimicrobial properties. The same review found that extracts of chicory root have antifungal properties. Additionally, certain compounds extracted from chicory root have antimalarial properties, justifying the historical uses of chicory as a treatment for malarial fever. Chicory consumption may offer protection for the liver, according to a September 2010 study published in "Food and Chemical Toxicology." At the end of the study, male rats that were supplemented with daily chicory showed modulated levels of total lipids and total cholesterol in the liver. The liver-protective benefits of chicory are partially attributed to its inhibition of free radical damage, an effect of its antioxidant properties. 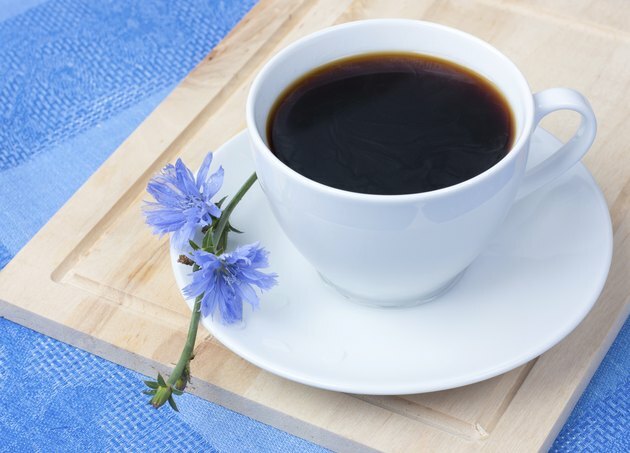 Chicory coffee's antioxidant effects may prevent against thrombosis and inflammation, according to a May 2011 study from "Phytotherapy Research." Participants who drank 300 milliliters of chicory coffee daily had reduced blood and plasma viscosity after only one week, which researchers attributed to the phenolic content of the beverage. These phenolic antioxidants also fight against free radical damage in the body, protecting major organs and systems from oxidative stress.